Today, with boundless joy in our souls, we glorify and praise the Holy Nativity and Theophany of our Lord and Savior Jesus Christ, by conveying to one another the greeting: “Christ is Born and Revealed, great tidings to all”. In the fullness of time, the words of the Prophet Isaiah came to fruition, “Behold the virgin shall conceive and bear a Son, and they shall call His name Immanuel, which is translated ‘God with us’”. The unapproachable Lord of glory and powers has become a child, has come to earth, and each individual may boldly approach and worship Him following the example of the shepherds and the Magi, who recognized Him and brought their gifts to the Savior Child lying in the manger. Today, dearly beloved faithful, it is we who bow down before the cradle of the infant Jesus, but what gifts have we to offer our newborn Savior? Our Lord does not want expensive material presents. The honored gift for the Savior is the Christian himself, who has accepted the prophetic tiding of “God with us” with a clean heart, and who tries to live every day according to divine Will, full of faith in God, love for his fellow man and with spiritual renewal with the Savior. The man, who is reborn with the graces of the Savior, transforms life, leading it always toward the good, toward the better and the perfect. Before the shadowless rays of the Lord’s presence and mercy, as Saint Gregory of Narek says, sins melt away, wounds are healed, corruption is cleansed, sadness withdraws, sighs retreat, darkness flees and the all-provident kingdom of the Benevolent God reigns. (Lamentations, Prayer 41.) Today and until the end of time, in accord with His promise, the incarnate God is with us. (Matthew 28:20.) He is with us with the grace of His salvation and His miraculous love of mankind. But are we with God? Is the world progressing on that path that Christ directed? The life of mankind, as well as our lives, dear pious sons and daughters, is full of different types of challenges, crises and troubles – fundamental social and economic issues, international and inter-religious controversies and conflicts, poverty, the fury for personal gain, the neglect of those in want, the lack of justice and humanity, as well as other deficiencies – which are all the result of paths that lead away from God. Before the reality of the world, man often assumes that the improvement of life and the wellbeing of society are reachable, especially, through the abundance of material goods. Whereas if God is not present in the souls of men, the material only divides society and dries up the happiness and joy of life. The wealthy live in anxiety, the poor in restlessness, and society at large in alienation. For the sake of material goods, men search for ways to steal, to deny, and to humiliate. For the sake of material goods, laws are broken, offices are abused, rights are trampled, and lives are ruined; for the sake of material goods, at times, alas, even in the name of God, against God. All which is done in the name of God is goodness for mankind; is consolation and joy. For the man who is with God, there are different standards for life, other values and principles for the purpose of being, “Love without hypocrisy, abhor what is evil, cling to what is good; be kindly affectionate to one another with brotherly love, in honor giving preference to one another.” (Romans 12:9-10.) With God, the position is service, human practices and abilities are the source of goodness, building the nation, and the wellbeing of life. Dear ones, with the mystery of the Holy Nativity, we have the daily grace to ascend the mountain of transfiguration with Christ, to live in the presence of the Lord, in a God-pleasing and soul-building environment, and to keep our course steadfast on the paths of God on moral and true values. The Holy Bible teaches us that walking with God saves us from temptations, multiplies our blessings and grants triumphs through heavenly power. Indeed our history testifies that our people, through fidelity to the Savior, have built the victories of their creative life and the ascents of our culture. It is with our Lord that we have overcome adversities, risen up from destruction and survived genocide. By the power of our Lord we have sprouted again in the Diaspora and protected our identity; we have reestablished our free statehood through our dispersed unity; we have always kept on high the vision of our promised land; and moreover, the belief that the Lord shall gather us together in our Homeland. Today, with the tiding of “God is with us”, let us bow down with bright hope and encouragement before the incarnate Savior’s cradle, to be warmed by His love and to accept His graces and blessings, so that we reform and strengthen our life in the Homeland and the Diaspora; so that we realize our national goals, create our people’s prosperous, happy and bright future, and always remain a people faithful to God. 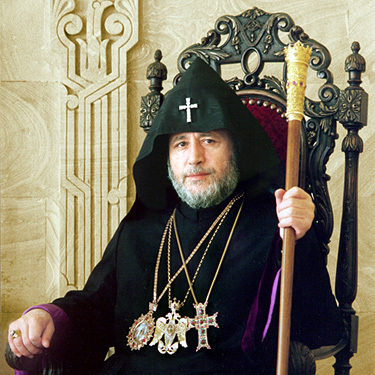 With this appeal and wish on our lips, we greet with brotherly love and the glad tiding of the Holy Nativity, the incumbents of the hierarchal sees of our Apostolic Holy Church: His Holiness Aram I, Catholicos of the Great House of Cilicia; His Beatitude Archbishop Mesrob Mutafian, Armenian Patriarch of Constantinople; His Eminence Archbishop Aris Shirvanian, Locum Tenens of the Armenian Patriarchate of Jerusalem; the heads of our Sister Churches; and the entire ranks of clergy of our Church, and appeal for the countless graces and strength of our Lord in their Christ-ordained mission. With the best wishes of the Lord’s Holy Birth, we greet His Excellency Serzh Sargsian, President of the Republic of Armenia, present today for the celebration of Divine Liturgy. We extend out greetings to President Bako Sahakian of the Artsakh Republic and all government officials of the Armenian people, appealing for success to all of their nation-building labors under the heavenly blessings of our Lord. We greet the leaders and representatives of diplomatic missions accredited in Armenia, and wish for the friendship and cooperation between our peoples and countries to always be improved through their fruitful efforts and renewing accomplishments. We extend our pontifical love and blessings to our beloved sons and daughters in the Homeland and the Dispersion. We offer prayers to heaven for the incarnate Savior’s graces of love, peace and solidarity to shine throughout the world every day, and especially over those lands where there are conflicts, among them war-torn Syria and in the lives of our brothers and sisters there who are facing difficulties and pain. May the souls of men always resound with the Christmas message of “peace on earth and goodwill to men” and be strengthened with the will to walk with God. May the Lord keep our native land at peace and secure under His Holy Right Hand, our Holy Apostolic Church bright and unshakeable, and bless the Armenian nation throughout the world, now and always. Amen. Christ is Born and Revealed. Great Tidings to Us All. This entry was posted in Featured News, News and tagged His Holiness, His Holiness Karekin, Holy Nativity, II, Jesus Christ by OCP. Bookmark the permalink.